Combating climate change is a major environmental concern for the European Union. Surface transport represents 28% of total CO2 emissions of which 75% are generated by road transport. Consequently, developing a more sustainable transport network is a priority. 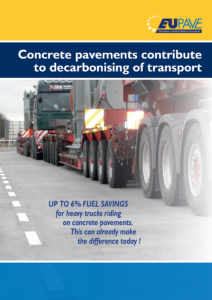 This brochure aims at disseminating the benefits of concrete against global warming, focusing on the fact that trucks consume less fuel on rigid pavements compared to flexible pavements. This statement, supported by international studies and researches of which the results are shown in this document, must become a key variable in decision making processes for sustainable infrastructure and, hopefully, become part of evaluation procedures for green public procurement.